Mission T.P. – it’s like mischief night, without the cleanup. 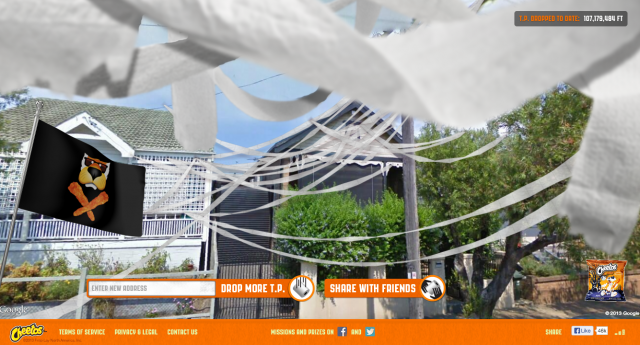 Cover the world with virtual toilet paper one place at a time, not only all over someone's house and yard, but also at national landmarks. Thanks to Cheetos, you can select any location and then watch Chester do the dirty work. 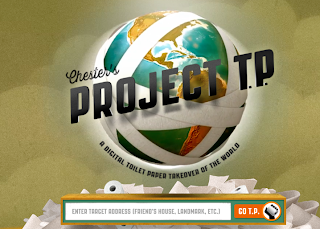 The TP’ing campaign is ‘Chester’s Project TP,’ and their mission is to cover the world with T.P. before Halloween! Go on… release your inner rebel.